The ultimate destination for footie fans, Casa Milan is the striking new headquarters of the city’s leading football (aka soccer) club, A.C. Milan, and is located just 10 minutes from San Siro Stadium where games are held. Known for its futuristic façade embossed with the team’s colors, the building houses an A.C. Milan museum and shop. 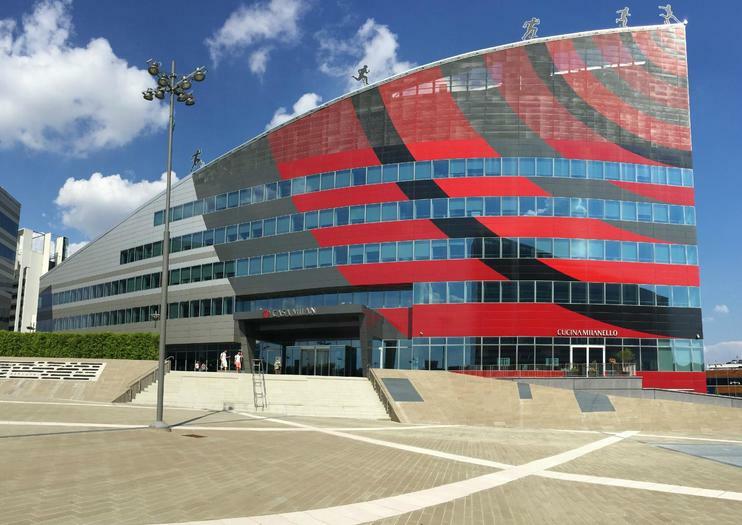 Join a Milan football tour that includes Casa Milan and a San Siro Stadium tour. Otherwise, take a hop-on-hop-off bus and combine stops at the Milan headquarters and stadium with highlights like the Duomo and La Scala. Don't miss Mondo Milan Museum, where interactive exhibitions and multimedia presentations take you through the football club's triumphs and trials. There's memorabilia on display and a Hall of Fame, Trophies Room, and Ballon d'Or Winners Room to marvel over. Shop at the official Casa Milan team store to purchase “Rossonero” scarves and other souvenirs in the team's signature red-and-black colors. Tickets for A.C. Milan games are sold at a ticket office inside the team store. The Casa Milan Bistrot/Fourghetti serves coffee, snacks, and meals. The headquarter complex is accessible to wheelchair users. Casa Milan is located in the Fiera Milano City/Portello district, northwest of Milan’s city center. You can reach the headquarters by taking the metro red line (M1), one of a number of city bus lines, or the hop-on hop-off bus. To combine your visit of Casa Milan with a live game, plan your visit to soccer season, which runs from August to May. Otherwise, the museum, shop, and bistro inside the team headquarters is open daily, year-round. Milan is home to two top-division soccer (football) teams, both of which play home games at San Siro Stadium, the largest in Italy. Built in 1925 for the A.C. Milan team, San Siro (also known as Stadio Giuseppe Meazza) became home to the city’s rival F.C. Internazionale team, or Inter, in 1947. Today, the stadium seats up to 80,000 fans for live games, concerts, and other events. Besøg det eneste officielle museum i AC Milan Club.Genoplev sejrene og besøg cupshallen med alle de trofæer, som klubben vandt. Se den hellige fodboldplads for San Siro Stadium og Casa Milan på denne halvdags tur. Hop ombord på en dobbeltdækker City Sightseeing bus og rejser til San Siro Stadium, hjemsted for AC Milan og Inter Milan. Efter at have udforsket stadionmuseet, nyd en let frokost på Casa Milan (hvis der vælges mulighed), AC Milan's modne nye hovedkvarter. Tilbring så længe du gerne vil på begge steder, passere flere byattraktioner på din åbne busstur tilbage til det centrale Milano.